Online designer store Net-à-Porter has finally confirmed the launch of a men’s division: Mr Porter will open in January, but you can already register online. The site will launch for the S/S 2011 season, with an edited line-up which includes global designer labels and niche brands, as well as editorial and style advice. Mr. Porter will feature brands such as Burberry, Ralph Lauren, YSL, Gucci, Margiela, Balmain, Margaret Howell, Rick Owens, John Lobband and Dunhill. 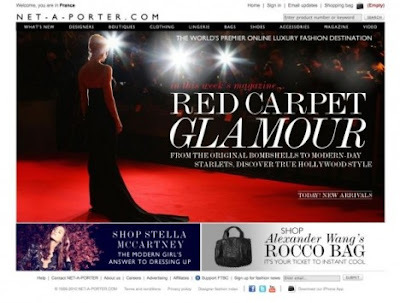 The menswear launch comes ten years to the day after net-a-porter was founded by the former journalist, Natalie Massenet. Earlier this year, she sold her remaining stake in the luxury online shopping destination to the Richemont Group for £50million. Wow....how cool is this! I'm sure that men will also enjoy the collective of hand-picked, unique items just as women have. Mr. Porter is sure to be a success!